Fadumo Omar Mohamed talks about her experience of working as a Mental Health Activity Manager for Médecins Sans Frontières. Fadumo has previously worked for MSF in Tajikistan and Ethiopia. 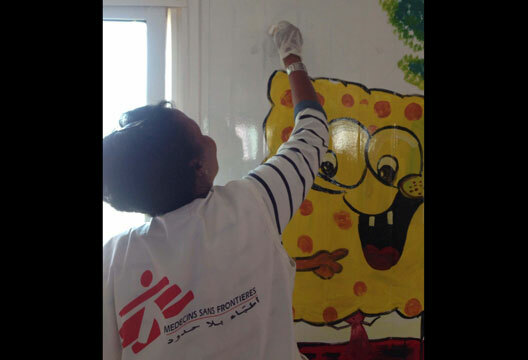 Her latest assignment took her to Jordan where MSF are treating war-wounded Syrians. I joined Médecins Sans Frontières (MSF) in 2013, and spent my first assignment in Tajikistan providing psychological support to Multi Drugs Resistant (MDR) TB patients. There, I saw children and adults given a 50/50 chance that, if you adhere to the medication, you may live. That environment is so different to what I saw in Jordan. Working in Psychological Health Centres in the UK in the past, I had experience of working with patients who are extremely traumatised. I had seen refugees and asylum seekers who had escaped from war zones, fleeing with physical and mental scars. But I had never worked in a context where I was seeing patients arrive straight from casualty. Working in this environment is certainly very challenging and a real learning curve. It means that recovery is amazing to witness. After surgery and treatment, there is a transformation as patients begin the healing process. There was a child who had suddenly lost their legs, who was supported to walk with prosthesis. As a psychotherapist, these moments really stay in your memory; making patients feel secure and supporting them to these milestones. We see patients gain hope as they learn to adjust despite the difficulty that impairs them. You see them laughing and joking – you see that they’re human; they are restoring some feeling of normality. Day-to-day my job involved ensuring that the patient was getting what we planned for them to get, in terms of psychological intervention that would stimulate the patients’ wellbeing. We did one-to-one therapy, group therapy, and recreational activities [Fadumo is pictured above, painting]. We played games regularly, like card games, darts and chess. We also sung, and brought musical instruments in. Language lessons were popular too. We hired English and Arabic teachers to teach those patients who wanted to read and write, and even helped to enrol children for formal education. That was really important for those who were staying a long time and waiting for other operations. Sometimes we requested our old patients to be motivators for the new patients. We had a patient who had both arms amputated but he was very strong emotionally after over a year with us. He was a motivator for our other patients who lost an arm or a leg. Others found it very hard to come to terms with these extreme changes in their lives. MSF is currently looking for Mental Health Officers to join its register. Find more information on the recruitment criteria and the application process.